Frankly, I've eaten enough pork belly, shaved Brussels sprouts, blistered shishito peppers and crispy kale to last me a lifetime. But if there is a culinary trend I can really get behind, it's the rush to ramen, a food fad that has been gradually gaining momentum for the past few years. My love for ramen runs deep. Some of my earliest childhood memories revolve around really good ramen, since I spent six of those formative years living with my family in Japan, outside of Tokyo. There are taste memories of things like tonkatsu, ramen, yakitori and such that are etched very deeply in my culinary soul. And so, I take ramen seriously. Obviously, I'm not talking about the noxious, salty, pre-fried-in-palm-&-cottonseed-oil, 10-for-a-buck packages of ramen that you buy at the grocery store. No, I'm talking about the homemade soup—much akin to Vietnamese pho—lovingly cooked with broth made from scratch and the highest-quality fresh ramen noodles. That's the ticket. Although pho has tickled the taste buds of many SLC foodies—there are dozens of excellent pho emporiums around town—ramen has been slower to catch on. But there have been gallant attempts. Dojo—now closed, sadly—brought forth the first real ramen I recall eating in Salt Lake City when it opened a few years ago. That was followed by Plum Alley's rockin' ramen, where the ramen noodles were actually made from scratch, in-house. Then Plum Alley closed and became Copper Common. And then, for a time, Naked Fish Japanese Bistro bravely decided to dedicate its lunch service solely to ramen. And, it was good. But, some customers were confused, expecting to nosh on Naked Fish's sensational sushi at lunchtime. Not everyone wanted ramen. Thankfully, that outstanding Naked Fish ramen lives on, in a sense, at Tosh's Ramen. And, given that this place has ramen in its name, I feel pretty secure in saying that ramen won't be going off the menu anytime soon. "Tosh" is chef/owner Toshio Sekikawa. You know that name if you're a fan of Asian cuisine here in Utah. He's the guy who virtually introduced sushi to Salt Lake City at the original Mikado restaurant, and also brought Asian fusion fare to Park City with Hapa Grill. That was before Johnny Kwon took over the ownership of Mikado and the restaurant morphed into Naked Fish Japanese Bistro, where Tosh continued to ply his trade after Hapa closed. I'm happy that Tosh now has a place to call his own. Since the day Tosh's Ramen opened, the joint has been packed. For the first couple weeks, Tosh kept running out of broth, and had to close his restaurant early. I've never been there when there wasn't a line of folks awaiting a precious seat. The place is small, but thankfully, the wait usually is too. Tosh is a wonderfully outgoing and generous guy, and Tosh's Ramen suits his personality. It's not a Nobu-style, over-the-top eatery, but rather a simple ramen shop—minimalist in décor and accoutrements. That's because the laser-like focus here is on one thing and one thing only: ramen. Some might call the menu limited, but I prefer to think of it as focused. There are five or six appetizers, one dessert (annin tofu) and five types of ramen to choose from, along with soda, Perrier, iced tea and hot or cold green tea. Beer and wine should be available soon. Like pho, ramen is really all about the broth. And, of course, Tosh makes his from scratch, simmering bones overnight and even making broth on Monday, his day off. So, my favorite ramen is the one that best showcases that glistening, delicious broth: tonkotsu ramen ($8.95). The broth is nearly clear, served in a huge ramen bowl with a very generous helping of excellent wheat and egg noodles from Los Angeles' Sun Noodle company. 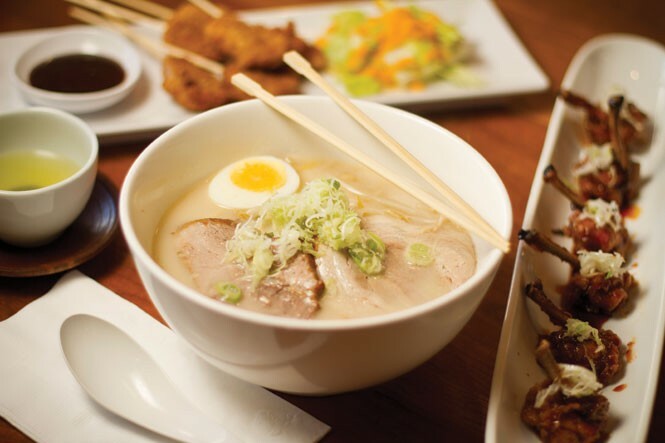 The ramen is adorned with crunchy bean sprouts, thin-sliced pork belly, half a hard-cooked egg, and minced scallions. Tosh's is usually filled with people who aren't ramen rookies. Take their lead and get your face down into that big bowl. Slurping is considered de rigueur. The shoyu ramen ($8.95) is a little richer and a little darker—seasoned with soy, but otherwise pretty much the same as the tonkotsu. The curry ramen ($10.50) is dark, thick and brooding—an excellent wintertime ramen with a hefty heat kick from the yellow/brown curry. That's not to be confused with karai ramen ($9.95), which is a spicy miso ramen, the best option for heat seekers. Tosh's also offers a vegetarian ramen (not made with meat broth) and vegan yam noodles, available upon request. The ramen servings are so plentiful that you won't need additional toppings. However, they are available, ranging from $1 for a poached egg to $3 for extra chashu (pork belly). You can also get kimchi, bamboo shoots and other add-ons. Among the appetizers, there is really good gyoza (Japanese dumplings), made in-house. The gyoza are filled with pork, greens, scallions and spices ($6.95/6 pieces)—or just veggies if you order the vegan version—and seared on one side. I also really enjoyed the Tokyo wings, which are chicken wing drumettes, deep-fried with a tangy sesame/teriyaki sauce ($7.50/6 pieces. And then there is the schnitzel-style pork kushikatsu: five pieces of breaded and deep-fried boneless pork served with rich, dark katsu sauce ($6.95). Add terrific service, and you can begin to understand why folks might wait half an hour to be seated for a serving of Tosh's ramen.